The Clean Development Mechanism (CDM) of the Kyoto Protocol allows industrialised countries (Annex I countries) to acquire Certified Emission Reductions (CERs) by implementing projects in developing countries. The CERs credited correspond to the reduction in greenhouse gas emissions that a given project achieves or the carbon that a forestry project temporarily removes from the atmosphere. Industrialised countries can use these CERs to fulfil their reduction commitments. Every CDM project is required to promote sustainable development according to the priorities of the concerned developing country. In forestry, only tree-planting on land that has been without forest since at least 1990 is eligible as afforestation or reforestation CDM projects. Projects that prevent deforestation or implement sustainable forest management are not yet eligible. How can CDM projects improve the living conditions of the rural poor? Are there examples that demonstrate this potential? What exactly is it that makes the difference for the rural poor? The San Nicolas Project in Colombia was designed with these questions in mind. Implemented since 2001, the project aims to use the CDM's potential for promoting sustainable management of the forest landscape and, at the same time, to improve the livelihoods of the 12,000 families directly involved. Today, it is possible to mention some outcomes. The region now has a master forest development plan adopted by the local farmers, who also actively participated in designing it. The plan integrates a CDM reforestation component and the use of timber and non-timber products. The CDM component includes 6 agroforestry systems, 1 silvopastoral system and several small plantations. By 2008, trees will have been planted on more than 2,500 ha of land, creating a new source of income for the community. In addition, the project involves activities regarding the management of existing forests, as well as capacity-building and entrepreneurship programmes that cover new products and markets. Beneficiaries of these programmes are now selling products based on non-timber products such as shampoo, soap, and essential oils. A key player in the CDM, the BioCarbon Fund of the World Bank, is finalising negotiations with MASBOSQUES, a public-private partnership that unites the owner of the local forests (mainly small farmers), local NGOs, governmental institutions and the municipalities in the San Nicolas region. Success in San Nicolas is based on participation and empowerment of the local community, along with high-quality documentation. Can other rural communities in developing countries also use the CDM to promote poverty reduction and sustainable development in rural areas? 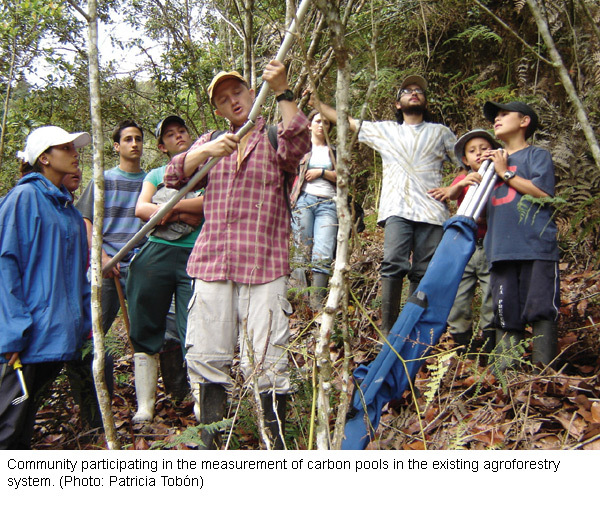 A positive answer to this question is indicated by other relevant arguments aside from the experience made in San Nicolas – for example, the availability of approved methodologies that ease the process of designing a CDM forestry component project. With regard to poverty reduction, the simplified modalities, procedures and methodology for small-scale project activities (SSC/AR) are of great importance. The SSC/AR are aimed at facilitating the participation of poor communities in the CDM. The CDM alone does not ensure empowerment of local communities, nor does it reduce poverty per se. Development cooperation can promote both participation and empowerment, on the one hand, and capacity-building for the CDM, on the other hand, thus ensuring that the poor benefit from CDM forestry components. Thus, it can be an important additional element that helps to achieve these development objectives in rural areas. > Approved A/R Methodologies. UNFCC. Development. Colombia: San Nicolas Agroforestry. The World Bank Carbon Finance Unit. This project has been co-financed by the International Tropical Timber Organisation (ITTO, with Switzerland-seco as a major donor), the Corpración Autónoma Regional del Rionegro-Nare (CORNARE), and the Swiss Federal Laboratories for Material Testing and Research (EMPA). A new publication by LivestockNet shows that livestock production can make an important contribution to achieving the Millennium Development Goals. Livestock often takes on the function of a “bank” for poor population groups, who use the animals as savings that they can fall back on in times of crisis. At the same time, livestock generates additional income that can be used to cover the costs of education or health services. Livestock also provides important components of a healthy diet. In agriculture, the animals provide traction and important nutrients for fertilising the fields. For women, in particular, livestock production offers an independent income opportunity and a possibility to raise their social status. Despite this potential, livestock productivity is usually rather low. Small-scale farmers often lack access to new technologies, as well as opportunities to sell their products profitably. In order for livestock-based development initiatives to be sustainable, they must take account of possible adverse effects: excessive intensification of production can have negative impacts on the environment; livestock production is fairly labour-intensive; moreover, it can interfere with crop production. 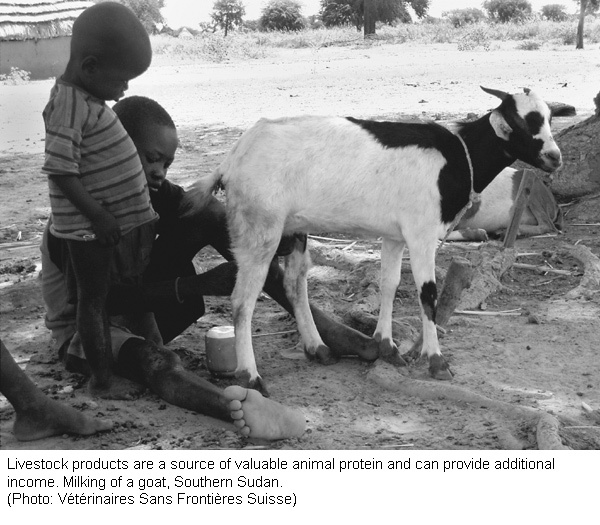 Source: Livestock Production and the Millennium Development Goals: The role of livestock for pro-poor growth. LivestockNet, May 2006. 20 pp. Verifor, a forest verification project, supports EU partners in tropical countries in their efforts to ensure legal harvesting of their forests, notably for commercial use. Its aim is to foster the development of verification institutions in these countries, which must be country-specific, representing the civil society and observe the principles of good governance. Consequently, the project focuses on the dissemination of research findings and the promotion of knowledge about verification systems targeting governments of forest-rich countries, the forest industry, civil society groups and the international development community. In addition to these services, the Verifor site has recently started with a new column: “Controversies”, which hosts critical articles on the verification debate. For example, one article criticises that little attention is given to social issues, in particular to poverty while the interests of the wealthy and powerful are protected. Source: The Verifor Project. Options for forest verification. Today, already 60% of the ecosystem services analysed in the Millennium Ecosystem Assessment are impaired. This can pose a direct threat to human health. For example, floods claim lives and cause injuries; intensified solar radiation can lead to skin cancer. But degraded ecosystems are also an indirect danger to people, and the poorest are often the most severely affected. Decreasing soil fertility reduces food production, thus increasing malnutrition and susceptibility to infectious diseases. These developments can be counteracted in two ways. The first approach consists in preventing or mitigating the destruction of ecosystems. The other approach concentrates on protecting people from the negative impacts of ecosystem changes. The two strategies complement each other. Priorities must be set in cooperation with those who are directly concerned, even if the interrelations between ecosystem degradation and human health often involve great uncertainties. Ecological damage affects health not only locally and immediately – adverse impacts can also occur delayed and in entirely different places. All the more, policy-makers are challenged to define measures for stopping this downward spiral. Source: Ecosystems and Human Well-being. Health Synthesis. World Health Organization, Millenium Ecosystem Assessment. 2005. 137 pp. Are free trade, environmental concerns and human rights incompatible? Representatives of civil societies of the South and the North demand that environmental concerns and equality issues be given more consideration in WTO negotiations and agreements. The WTO, on the other hand, points to its main task of regulating international trade, and distances itself from the role of being an institution with a major responsibility for promoting human rights or environmental legislation. A public hearing between EU and civil society representatives preceding the 6th WTO Ministerial Conference in Hong Kong (2005) intended to initiate a constructive dialogue which would eventually lead the EU to support trade regulations that take account of social justice, equality, and ecological sustainability. The report of this hearing contains presentations of the various stakeholders. It is perhaps symptomatic for the current state of affairs that the report only summarises the discussions, thus providing an impression of the various positions, but does not contain any recommendations. An analysis of the Hong Kong Declaration in the second part of the publication, however, points out the fact that so far the WTO has hardly taken up social and ecological concerns. Land tenure in Africa is a complex issue. Legal provisions are intertwined and overlapping with customary law and religious concepts. Common land reforms usually disregard this complexity; they are well-intended, but often point to the wrong direction. Instead of promoting the formalisation of access rights to common land, politicians concentrate on dividing the land into individually owned small plots. This affects many African pastoral societies in particular. Supporters of such land subdivision usually argue in ecological terms: they understand common land as being open and freely accessible, which leads to overuse and soil degradation. However, the opposite is true. Once the landless are given secure access rights to the common property, and only then, they will begin to manage it sustainably in their own interest. Moreover, this type of unorthodox land right policy would be more appropriate to conserve religious and cultural ties and guarantee social continuity. This publication is based on a workshop and features 12 concise summaries containing further highly interesting and very concrete new findings with regard to land rights. Source: Land Rights for African Development: From Knowledge to Action. Esther Mwangi (ed.). CAPRi Policy Briefs. 38 pp. Poverty reduction and conservation of natural resources mutually influence each other, both positively and negatively. Many actors and levels are involved, and consensus between development and conservation specialists is not always given. The new “Poverty and Conservation Learning Group” initiative takes this as the point of departure and aims to identify knowledge gaps, as well as connect existing knowledge with new research findings and make them accessible. This service addresses policy-makers and implementers alike: while mutual learning is intended to lead to better-concerted policies, the access to best practices and other relevant documents assists the field work. Four databases focusing on literature, organisations, initiatives and case studies form the centrepiece of this web portal. Further functions are planned for the future, such as a forum for exchange and a section on methods and tools. Around ten years ago, agricultural extension services in the “Office du Niger” area, where the main crop is rice, began to reorganise themselves. This reorientation was influenced by a democratisation process that set in throughout the whole of Mali at that time. Farmers asked for extension services to be under their own control. The idea was to transfer the management of these services from the state to farmers' organisations. The farmers were to determine the type of extension service they wanted, in return, the services were to be funded from farmer's contributions. Over the past ten years, these extension services – along with the farmers' organisations themselves – have developed into stable, transparent and reliable partners for the farmers. However, funding them from farmers' contributions has proved difficult. Many smallholders cannot afford the fees, even though they are low. Source: Appui et conseil aux organisations paysannes en zone Office du Niger. Du projet centre de prestations de services aux « Faranfasi So ». Jean-Bernard Spinat, Bakary Traoré, Anne-Sophie Saywell. Groupe initiatives, Traverses No.16, février 2006. 45 pp. The construction of access roads to remote rural areas entails pronounced changes. How can the poor benefit from this development? The Asian Development Bank has analysed this question through case studies in Indonesia, the Philippines and Sri Lanka. An access road cannot influence negative overall conditions, such as an unfavourable climate. However, roads can improve access to education and health services, and they create new economic opportunities. The latter have proved to be of little benefit to the poor, who simply lack the necessary resources to start trading or take up an other smallest-scale business. Road construction and maintenance, as well as commercial agriculture, sometimes offer wage labour opportunities for the poor. However, the poor benefit more from improvements in the network of paths within the village and in its immediate surroundings. This allows them to save time in their daily work. Access roads leading out of the village are used by the poor only sporadically and in emergency situations. A road alone thus hardly improves the situation of the poor. They need additional support in order to benefit from access roads. Along with recommendations for project planning, this interesting report contains informative brief portraits of households who are concerned by this issue to varying degrees. Source: When Do Rural Roads Benefit the Poor and How? Understanding why producers turn to new technologies for their production systems and household economies means understanding their economic rationale and their livelihood strategies. The study's overriding interest lies in its “triangular” (multi-faceted) approach to this process, encompassing social, anthropological and historic analyses. For example, in the north of El Petén in Guatemala, the National Council for Protected Areas (CONAP) initially adopted a long-term conservationist vision while the local communities were primarily interested in short-term economic issues, leading to conflicts between them. 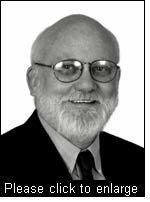 Learning from its past errors, CONAP redefined its intervention strategy in the mid-1990s. 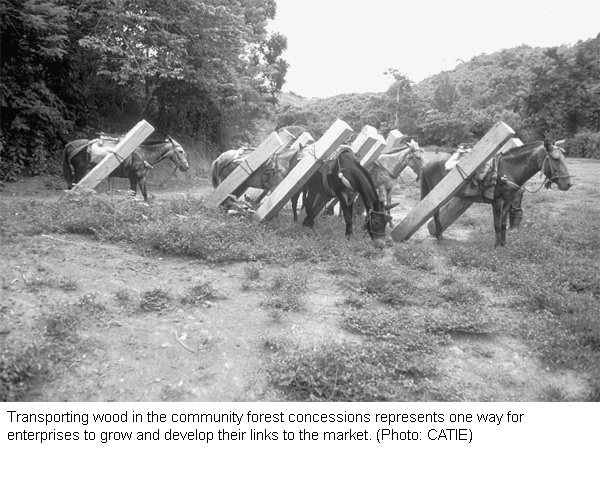 Contractual forest concessions granted to communities (CFC) successfully channelled these conflicts and integrated communities interests in conservation policies. Gradually, ventures aiming to use timber commercially began to crop up in a host of communities which manage their CFC with NGO support. Effective management of the profits generated by this new activity enables communities to invest in equipment, reducing production costs and improving product quality for export. Source: Procesos de innovación rural en América Central. Cornelis Prins. CATIE, 2006. 244 pp. IRRI is shifting its focus from food security to poverty reduction. Efforts will now concentrate on the areas under rainfed cultivation by small-scale farmers rather than the highly productive irrigated areas. Consequently, IRRI will enhance its engagement in sub-Saharan Africa and generally focus more on people and their livelihoods. The sustainability of production systems and the impacts of climate change are gaining significance. More frequent droughts, floods, and seawater intrusion require rice varieties that are more tolerant of drought, flooding, or salt. Based on new scientific findings, IRRI sees a great potential in improving the nutritional value of rice in order to prevent diet-related diseases. Robert Zeigler emphasises that the achievement of these goals requires partnerships at all levels. New findings must be made available to all people in an appropriate form by harnessing the potentials of information technology. 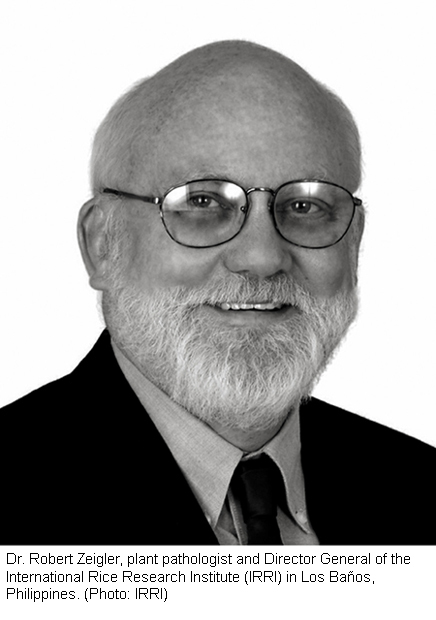 > Interview with Robert Zeigler, Director General of the International Rice Research Institute (IRRI). InfoResources, July 2006. 10 pp. > Bringing hope, improving lives: strategic plan, 2007–2015. International Rice Research Institute (IRRI), 2006. 61 pp.